Heineken has taken the most-shared accolade with just 14,191 shares this week in a slow seven days for ad sharing, according to figures from social video experts Unruly. The beer ad, created by Wieden & Kennedy New York, has shot through the chart to first place, having been in seventh place last week with 6,163 shares. 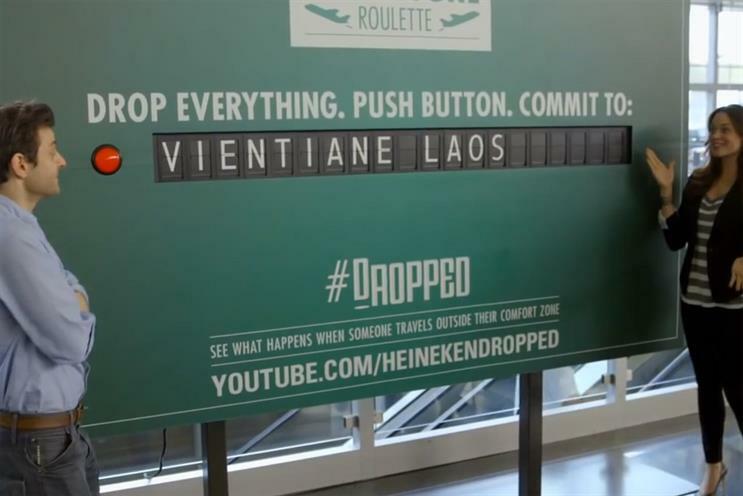 The video, "departure lounge roulette", features Heineken representatives approaching airline travellers with the chance to change their intended destination with another mystery destination determined randomly by the brand's "drop everything" board. Following the success of its "ship my pants" and "big gas savings" ads, Kmart re-enters the chart this week with two new ads by DraftFCB. Both ads promote the US retailer's back-to-school range and have been shared a combined 18,987 times this week. Google has also managed to secure two places in this week's chart with ads promoting its Chromecast dongle and Nexus products. In fourth place, the ad for Chromecast showcases the USB device from Google that allows the streaming of content from tablet and mobile devices to TVs. 72andSunny created the ad. The second ad from Google, in tenth place, shows Google's Nexus tablet device and promotes Google Now – an app that allows users to perform searches and functions using voice commands. Autofuss created the spot. The Google ads were shared a combined 14,612 times in the past seven days. The chart, produced using figures from Unruly, tracks the number of shares of ads across Facebook, Twitter and the blogosphere. Ads older than 30-days are not included.